Since 1985, Burglin Law Offices, P.C. has represented over 5,000 individuals charged with DUI in Marin County and throughout northern California. Attorney Paul Burglin is highly regarded by his peers as one of the most accomplished DUI defense lawyers in the nation. He has been lead counsel in more than 120 DUI jury trials, and over the years has handled numerous appeals and writs dealing with license suspensions and revocations. Mr. Burglin has extensive knowledge of California DUI laws, and the most effective defense strategies to minimize the negative consequences of a drunk driving charge. Because of his in-depth understanding of the DUI process, unique legal insights, and successful track record, he is frequently sought out by DMV hearing officers, judges, and prosecutors when someone close to them is facing a DUI charge. Attorney Burglin is a Regent with the National College for DUI Defense, and the Editor-in-Chief of its national journal. He is also one of only five attorneys in California that is Board-Certified in DUI Defense, as approved by the American Bar Association. Since 2004, Mr. Burglin has co-authored California Drunk Driving Law and he is a graduate of the University of Indiana's comprehensive course on chemical testing and scientific protocols in DUI cases. In California, even a first-time DUI (or first DUI within a 10-year period) conviction can mean heavy fines and penalties, driver's license suspension, DUI school, and even jail time. With the right strategies, however, it may be possible to have the charges against you reduced or dismissed altogether. Most DUI arrests in California are charged as misdemeanors. However, if you are facing your fourth or more DUI offense in the past 10 years, have any prior felony DUI conviction, or your DUI resulted in death or injury, it may be charged as a felony. If you are involved in a motor vehicle accident while driving under the influence, the consequences are more severe than a DUI without this aggravated circumstance. You could be charged with either a misdemeanor or felony, and penalties may include heavy fines, prison or jail time, and other serious consequences. Paul was very helpful and supportive during my DUI case. He was able to get my charges reduced and get my license back. I felt he was very understanding of what I was going through, as well as being very intelligent when it comes to DUI laws. He would always respond to my emails and calls ASAP. I HIGHLY recommend him. If I ever need an attorney again in the future, he is the one I will call upon. I was arrested for DUI and blew a .09/.09 on the breath machine. The highway patrol officer said I almost caused a car accident by swerving into an occupied lane on the freeway right in front of him. Mr. Burglin and his expert witness convinced the jury that I was under the legal limit at the time of driving and I was found 'not guilty' of everything. I was sitting behind the wheel of my truck with the engine running in the middle of an intersection. I had a .25 alcohol level and I threw up in front of the cop. I bombed the field sobriety tests. The Marin County jury hated my guts but they found me 'not guilty' on all charges. Paul Burglin has been my attorney in four separate jury trials - two in Sonoma County and two in Marin County. Two cases ended in hung juries and the other two ended in full acquitals. The last trial involved a cop who testified under oath that I had pointed a gun at him. Burglin absolutely destroyed him on cross-examination. It was unbelievable! Drivers who hold Class A or Class B commercial licenses depend heavily on maintaining a valid license to make a living. Unfortunately, California law is tougher on commercial drivers than on drivers with standard Class C licenses. For example, if you are operating a commercial vehicle, you can be charged for DUI with a blood alcohol concentration of just .04 percent, half the legal limit of individuals driving non-commercial vehicles. In addition, commercial driver's license (CDL) holders who are arrested for DUI can lose their commercial driving privileges for a minimum of one year, even if they were not driving a commercial vehicle at the time of the DUI offense. Many individuals are falsely accused by someone close to them of domestic violence each year. Just being charged with the crime most often results in a restraining order, and the consequences of a conviction can be very severe and extend to areas such as loss of employment and spousal support. Because domestic violence cases frequently involve the use of alcohol by one or both parties, attorney Burglin is often called upon to handle the defense for these types of cases. 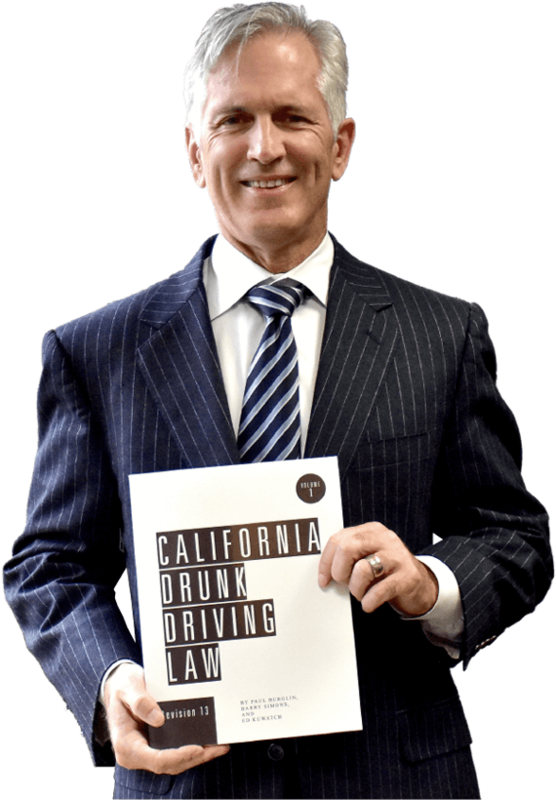 Attorney Paul Burglin co-authors California Drunk Driving Law, a two-volume legal guide that is commonly referred to as "the Bible of DUI Defense." This book includes hundreds of creative, decision-based DUI defenses, authoritative interpretation of over 1,700 cases, answers to most questions that arise in day-to-day DUI defense, and much more. If you are facing a DUI charge, there is no one better to defend you than the lawyer who writes the book! California Drunk Driving Law is revised annually with the most up-to-date information, and it is frequently referenced by other lawyers in California when they are preparing a DUI defense. Beware of legal professionals who invade your privacy with phone calls and misleading marketing materials mailed to your home. These lawyers are frequently referred to as "dump trucks" who will do little or nothing to defend and help you. Attorney Paul Burglin does not operate this way. Most of his clients come from professional referrals generated by a proven track record of success. Mr. Burglin does not accept everyone as a client, because DUI defense cases require the proper time and attention to ensure a positive outcome. If you do become his client, he will put his experience to work to personally mitigate your situation as much as possible. For a personalized consultation with attorney Paul Burglin, contact our office today at 415-729-7300.